The maps fiasco should have Google laughing and probably Jobs twisting a bit in his grave. After all, why was there a need to challenge in an area where Google already is numero uno. Yahoo did that. Microsoft did that. And the lessons were clear for Apple before they took the decision. Also it would have made sense to do it once Apple had perfected their maps application and field-tested it to atleast match accuracy with Google Maps. However they preferred to do it the grandiose style ignoring the consumer preference. And three months down the line.. things have fallen back. All is not lost though. Tim Cook did damage control with grace. 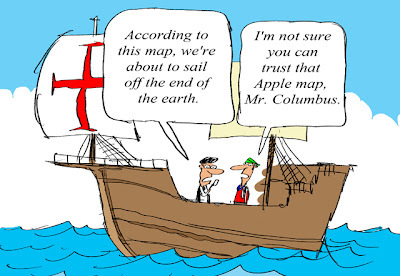 Apple can still try at bettering their maps application. And see if something innovative can be offered that Google Maps doesn't offer. Mashable posted this funny comic on that note.